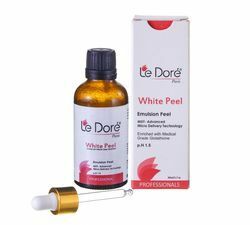 Le Dore White Peel is a glutathione based chemical peel which offers wonderful results with the unique MDT(Advanced Micro Delivery Technology) technology. we supply all kinds of Chemical peel for cosmetics treatment. spa& beauty treatments. Pack Size: 50 ml Or 1.69 Fl. Oz. Backed by rich industry experiences; we are highly engaged in trading a premium quality range of Glyco 50 Peel. Glycolic Acid is Peeling agent that removes the superficial Dead skin layer and causes growth of new lighter glowing skin. Chemical Peels are acids therefore should be used under the Supervision of trained cosmetologists.